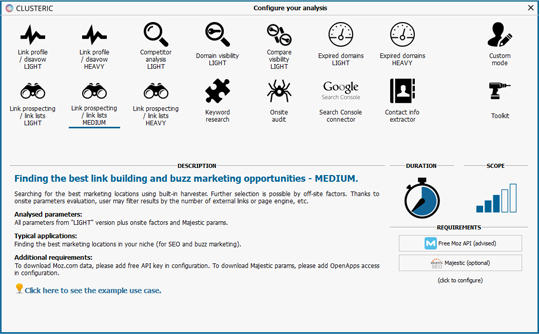 Clusteric Auditor | SEO Audit | Backlinks, Website & Competition SEO Audit in one tool. Use one of the analytic modes or combine modes and improve your rankings in Google. 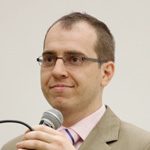 Wondering what to do to sell more, to attract new users, understand what stands behind the position of the competition? Which activities are paying off and which need improvement? Has your organic visibility suffered after one of the Google’s updates? Clusteric helps you to solve the most common organic visibility issues and implement “white hat SEO” tactics for small business and enterprises. Go through the various modes and see how we can help you. We released the first version of Search Auditor to make link profile analysis easier. From this point, we’ve walked a long way and made great efforts to become a complete audit tool and much more than this. 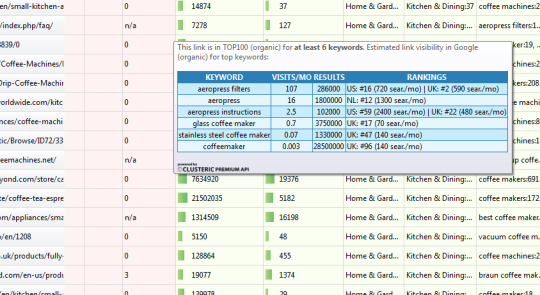 Thanks to suggestions coming from our users, we’ve added more analysis modes including: link audit, link analysis, link prospecting, seo audit, keyword difficulty estimation, expired domains research, competitors’ analysis or search visibility analysis. 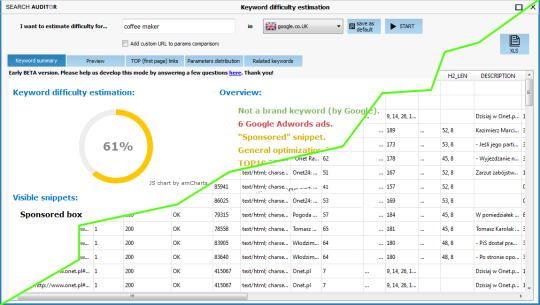 Clusteric Search Auditor blows your mind and makes you a SEO god. Tasks such as acquiring new links, link prospecting, seo audit, existing backlinks analysis or expired domains research reach the new quality level. We work hard to provide you with the neccessary metrics, all in one place. CLUSTERIC Search Auditor is capable of evaluating more than 100 parameters, combining both the on-site and the off-site metrics. Over 30 parameters come from CLUSTERIC PREMIUM API. Our robots crawl the Internet, day and night to build a multidimensional database covering search visibility metrics, backlinks, social signals and much more. 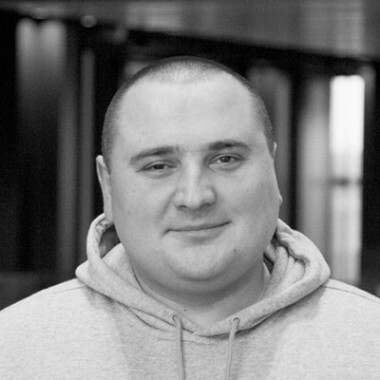 Learn more about CLUSTERIC PREMIUM data API. 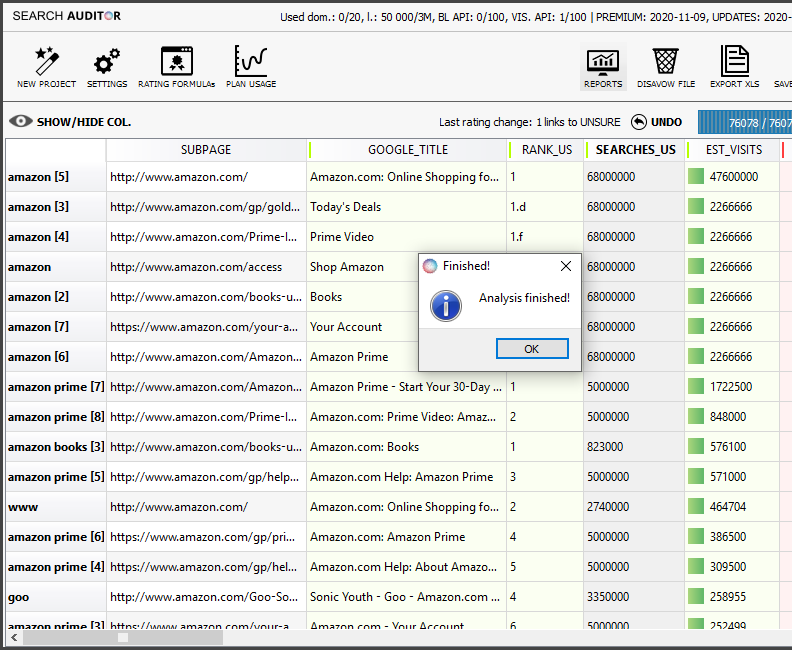 The Clusteric Search Auditor is a unique link analysis solution prepared for the Polish market, comparable to similar tools used around world, but available at an affordable price. It is also distinguished by the fact that it was prepared by a team taking into account the opinions and needs of specialists in the SEO industry, and its features work for both link analysis of domains penalized by Google, as well as those that seem to be in strong and stable condition. Because in today’s SEO world, there are no simple and unambiguous solutions—what counts is a speedy analysis, experience, foresight and constant monitoring. Clusteric Search Auditor blows your mind and makes you a SEO god. Tasks such as acquiring new links, link prospecting, existing backlinks analysis or expired domains research reach the new quality level.